This page is currently out of date. We are updating it with our most recent analysis, which explains how we now value TrueBlue points at an average of 1.6 cents apiece. JetBlue Airways is known for its affordable fares and frequent flights to beach destinations. From its early focus on the eastern U.S., the airline has gradually expanded operations to more areas of the country. Hub cities include Boston, New York (JFK), Orlando, Fort Lauderdale, Florida, and Long Beach, California. It also flies to dozens of locations in the Caribbean, Mexico and South America, including Turks and Caicos and St. Thomas. 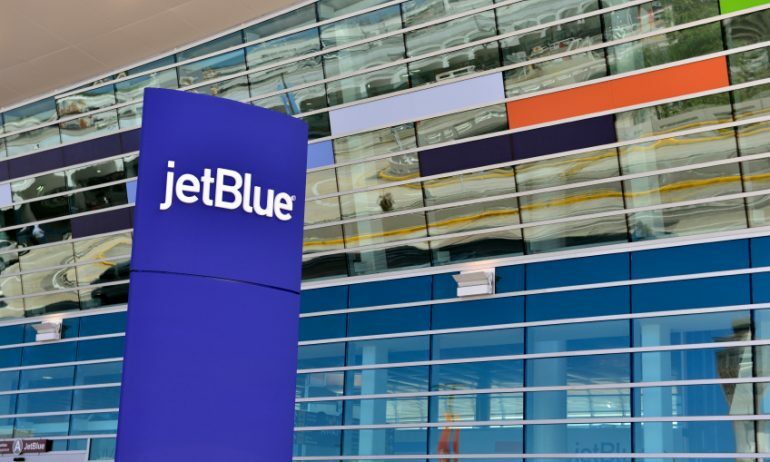 If you fly JetBlue frequently, or you could do so, the airline’s fares can become even more appealing when paired with JetBlue’s TrueBlue rewards program. JetBlue’s program gives rewards called TrueBlue points, which NerdWallet values at an average of 1.4 cents apiece when redeemed for flights. Joining the TrueBlue program is free and you can start earning points by booking flights online. Points do not expire, according to JetBlue’s website. Blue 3 base points plus 3 bonus points per dollar spent 0 JetBlue's basic fare. No extras. Ticket changes incur a fee. Extra charge to fly standby. Blue Flex 3 base points plus 5 bonus points per dollar spent 2 No change or cancellation fees. No extra charge to fly standby. Expedited security access at select airports. Mint 3 base points plus 3 bonus points per dollar spent 2 JetBlue's most expensive fare. Lie-flat seats. Free in-flight movies. "Artisanal dining." Faster check in. First-in-line baggage pickup. Full details about what you get (or don’t get) with JetBlue’s fare classes are available on JetBlue’s “Our Fares” page. Other flight programs offer additional points: Purchasing an “Even More Space” seat earns you an additional 200 TrueBlue points. Flying with your pet gets you 300 extra points, and booking a JetBlue vacation package (airfare plus hotel) earns 6 points per dollar spent. According to JetBlue’s website, there are no blackout dates on flights operated by JetBlue, so you can use points for any seat at any time, and points don’t expire. In addition, JetBlue offers the option of pooling points with family and friends. Earning on other airlines: JetBlue has partnerships with a handful of other airlines, such as Icelandair, Hawaiian Airlines and Emirates. In general, the number of points you earn with partners is based on distance flown. NerdWallet’s favorite co-branded credit card for the airline is the JetBlue Plus Card. It earns 6 points per $1 spent on JetBlue purchases, 2 points per dollar at restaurants and grocery stores and 1 point per dollar on all other purchases. It’s the rare airline card that offers bonus points at merchants other than the airline itself. You start off with a nice sign-up bonus: (This offer is no longer valid on our site) Earn 30,000 bonus points after you spend $1,000 on purchases within the first 90 days. And cardholders earn 5,000 bonus points on their account anniversary every year. The annual fee is $99. Search for partners and get details about earning at the TrueBlue partnerships page. You can buy additional TrueBlue points through the website, but they are expensive. If you buy 1,000 points, which NerdWallet values at $14, you will pay $37.63 — so you are paying more than double what they are worth. You can use TrueBlue points to book flights or vacation packages online. The number of points required for a free flight depends on the fare, according to JetBlue. When you search for flights at JetBlue.com, you have the option of seeing the fare displayed in either dollars or points. You can also donate points to charities, buy magazine subscriptions with them or use them to book JetBlue vacation packages or flights on Hawaiian Airlines. JetBlue says it is adding more redemption partners soon. Unlike other airline loyalty programs, TrueBlue doesn’t offer any redemption options that give you less than 1 cent of value per point, so you’ll likely get a decent return on your rewards no matter how they’re spent. Purchasing vacation packages, which include flights bundled with hotel accommodations, gets you about 1.6 cents per point, according to NerdWallet’s valuations, which makes it a more valuable redemption option than booking flights alone. An even more valuable option is redeeming points for magazine and newspaper subscriptions, which comes out to around 4 cents per point. Given the good value of TrueBlue points regardless of how you redeem, your only truly bad option would be to fail to use them. Fly 30 JetBlue segments and earn 12,000 base points in a calendar year. A segment is defined as a single takeoff-to-landing flight. Earn 15,000 base points in a calendar year. Note that the points needed to qualify for Mosaic are base points, which you earn at the rate of 3 per dollar when purchasing JetBlue flights. (So, 12,000 base points equals $4,000 spent on airfare, and 15,000 base points equals $5,000.) Bonus points earned for booking through JetBlue.com do not apply. 1 point per dollar spent on other purchases. For domestic flights, the points value ranged from 1.3 to 1.7 cents each; for international flights, 1.3 to 1.6 cents.